The Killeen course is very much the flagship course at the club. The Killarney lakes and high mountain range provide an imposing backdrop to this Championship course. Re-opened in June 2006 the course is slightly longer with faster greens that have been brought closer to the water hazards around the course. At 6593 metres it will challenge long hitters with accuracy being vital as there is water on virtually every hole. The Killeen course at Killarney is a parkland course like no other Ireland has to offer. Set in the wounderful town of Killarney the tourest capital of Ireland this is one course not to be missed. Killeen course has achived world status in holding the Irish Open in 1991 & 1992 both won by Nick Faldo of Endland, and now again it stands out among the crowd in 2010 & 2011. The Killeen couse has every thing any parkland course could want and so much more. Located in and around the lakes of Killarney with the Mountains overlooking this majistic course. The course itself is indeed challanging for all levels of golfers. The layout is breathtaking, the senery while playing is unmatch in any part of Ireland. By the time you reach the 18th tee box for the par 4 looking into the club house then you know you have been somewhere special and will want to play this course again. Make sure to have luch at the golf club overlooking both courses as the food is mouth watering and the staff have a 1000 welcomes – what would you expect from Kerry people in Farness ! Killeen was the host venue of the 2010 and 2011 Irish Open with England's Ross Fisher and Simon Dyson emerging the respective winners. Nick Faldo on winning The Irish Open in 1991 was one of only three players to finish under par. The challenging golf is matched by the spectacular views with the 10th being a firm favourite where you are playing virtually onto the lake. Welcome to Mahonys Point course at Killarney Golf and Fishing Club. Indeed a round at Mahonys Point is just the ticket for sheer relaxment around the Killarney Lakes and the beautiful flowers, and settings that make this course such a pleasure to play. The golf course itself is a delight to play with several great holes all easy to get round with golf carts easy availability from the pro shop. Mahonys Point is a hidden gem parkland courses set in the vally around the highest mountains of Ireland and the Lakes of Killarney. Watch out for local wildlife deer that roam throughout the course, the fishing on the lakes and the sheer tranquility of this area makes golfing at Mahinys Point not to be missed. The Mahonys Point course caters for all levels of golf from beginers to the Pro’s so dont be shy about asking for this Hidden gem at Killarney. The shortest of our three courses has spectacular views of the famous Killarney lakes overlooked by the McGillicuddy Reeks, the highest mountain range in Ireland . The final three holes are breathtaking as you play towards the lake with the 18th described as “one of the most memorable holes in Golf”, a par three of nearly 200 yards that requires a huge carry across the corner of the lake. Discover for yourself why the 18th is the most photographed in the world. While Mahony’s Point is the shortest, most scenic and friendly of our three courses, it presents an enjoyable challenge to golfers of all standards, the combination of undulating greens, well positioned bunkers and water hazards ensure that there is enough danger to spoil a good round. In 1991 The Irish Open was held on Killeen with a clinical Nick Faldo emerging as winner over Colin Montgomerie with David Feherty setting a course record of 65 on the closing day. The colourful Payne Stewart was the crowd favourite. Mixed conditions and a tough course earned huge respect from all the professionals. In 1992 huge attendances witnessed a dramatic finale with Nick Faldo emerging as winner in a heart stopping play-off with the relatively unknown South African, Wayne Westner. A tired Faldo described the course as a tough, demanding course that is long, narrow and breezy. This prestigious event returned to the club in 2010 & 2011, where England's Ross Fisher & Simon Dyson were respective winners. In 1975 the European Amateur Team Championship was held in Killarney. Thousands of spectators watched the competition under fabulous sunshine as the Scottish ran out as eventual winners. In 1996 the Curtis Cup was played on Killeen with the ladies of Great Britain and Ireland beating the USA is a famous victory. The new course Lackabane hosted the Irish Ladies Open Championship in 2002, which was won by Iben Tinning from Denmark and the following year the competition was held on Mahony’s Point and was won by Sophie Gustafson from Sweden. The Ryder Cup Challenge Tour Event in 2005 was won by Mark Warren of Scotland. It was held on Mahony’s Point and returned there again in 2006 to be won by Australia's John Wade. 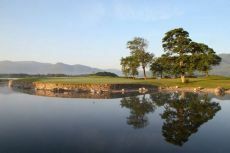 Killarney Golf Club Green fees are 75 Euros a person Mahony's Point & 100 Euros for the Kileen Course for 2013 season High Season. Or conbine both course with Ballybunion and Killarney Golf Club Vacation Packages.